The incidence and severity of chilling injury depend upon storage temperature and duration. The minimum safe temperature is 5°C (41°F) for up to 8 weeks. 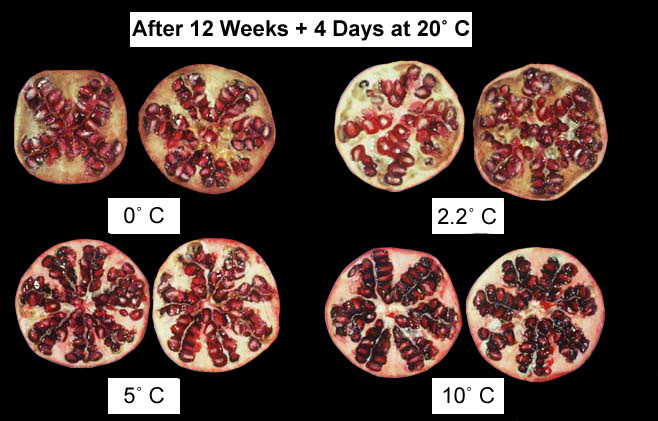 Chilling injury can be a major cause of deterioration of pomegranates during marketing following exposure to temperatures below 5°C (41°F) during storage and transport for longer than 4 weeks. External symptoms include brown discoloration (scald) of the skin, pitting, and increased susceptibility to decay. Internal symptoms include brown discoloration of the white segments separating the arils and pale color (loss of red color) of the arils. Pomegranate are susceptible to chilling injury if stored longer than one month at temperatures between their freezing point (-3°C or 26.6°F) and 5°C (41°F). Upon transfer to higher temperatures, respiration and ethylene production rates increase and other chilling injury symptoms appear; their severity increases with lower temperatures and longer durations of chilling exposure. External and internal browning is related to oxidation of phenolics by polypherol oxidase. Storage in a 2% oxygen atmosphere at temperatures below 5°C (41°F) reduces severity of chilling injury symptoms. Avoid exposure of pomegranates to temperatures below 5°C (41°F). Elyatem, S. M. and A. A. Kader. 1984. 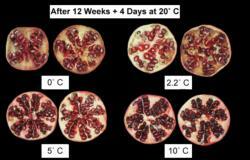 Post-harvest physiology and storage behavior of pomegranate fruits. Scientia Horticulturae 24:287-298. Kader, A. A., A. Chordas, and S. Elyatem. 1984. Responses of pomegranates to ethylene treatment and storage temperature. California Agriculture 38(7 & 8):14-15.